Just in time for the holiday season! Genesee Community College’s Collegiate Entrepreneurs Organization (CEO Club) has expanded its SCHOLARS brand line of products to include the brand new Apple Cinnamon Pancake Mix. 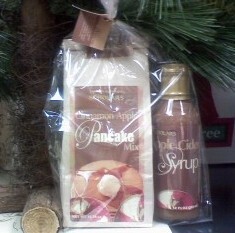 The pancake mix is sold as a gift pack with the popular Apple Cider Syrup that was developed last year. The two products combine not only as a delicious meal, but as a great holiday gift. The Apple Cider Syrup project began over two years ago to produce and market a gourmet food product that would provide practical, hands-on business and entrepreneurial learning opportunities for Genesee students. The club developed and now markets SCHOLARS brand Apple Cider Syrup; an apple pie flavored syrup used over pancakes, waffles, French toast, pork recipes and even ice cream. The Apple Cinnamon Pancake Mix is an expansion of their line, and a complimentary product to their wildly popular Apple Cider Syrup. The syrup and pancake mix gift packs retail for $14.99 and can be purchased from local retailers as well as the Barnes and Noble Book Store at Genesee Community College. (The Apple Cider Syrup alone retails for $9.99.) Profits from the syrup and gift pack sales will be put back into the program, as well as used to fund student scholarships. For further information, please contact CEO Club advisor Barbara Shine at 343-0055 x6319.